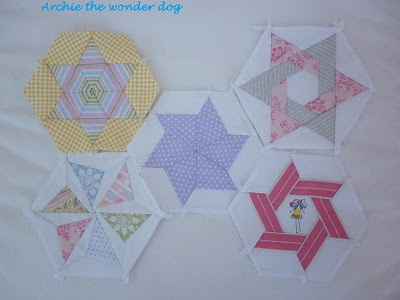 ...I'm going to show off some hexies and some very cute photos of Archie! The top right one looks much better in real life! And so does the one on the top left! The dotty one makes me smile! Last one - well done for making it this far! And I've even got round to making a proper thread catcher to replace the 2" square of wadding I've had in there since August. (It took fifteen minutes one afternoon and I have no idea why it's taken me so long to get round to it, I blame the idle-itis!). 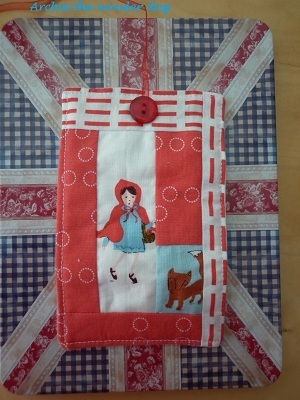 I used some of the 'A Walk In The Woods' that the very talented Aneela Hoey sent last November - I love this fabric! I've only shown the front as the back is just a piece of wadding covered in threads...not particularly interesting or appealing but I can't tell you how much better it is than a scrap of wadding! A RRH thread catcher with a guest role for foxy! It's been raining most of the day today (yeah - no sun cream required!) but when it's sunny (and warm - the two don't necessarily go together up here!) 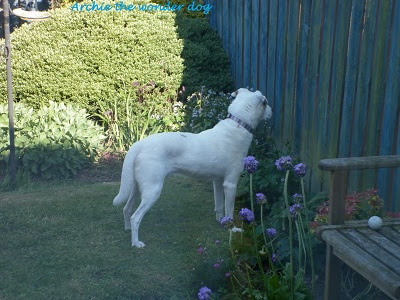 my neighbours tend to cook their tea on the barbecue and eat outside...and guess who likes to watch?! I know they're cooking...I can smell it...and I can see plates on the table! Did she just shout "Do you want your tea?!" I think she did - best go and check! I may not be going to the Fat Quarterly Retreat but I have had some wonderful post over the last few weeks so I'll be posting soon(ish) about the lovely things that have dropped through my letterbox - I think quilters (or at least those that blog!) are the kindest people in the world and I have the proof! If you're going to London this weekend have a fabulous time and say hello to each other for me...and if you see any crumbs on the floor (or need your sewing covering in white hair!) think about how useful Archie would be! If you're not going to London I hope you still have a fabulous weekend! Wow Helen ! Those hexies keep getting better and better! I ove them all not the least bit bored in fact want to look at them again! Poor Archie! The starving dog that he is! Reminds me of poor little Emily - she used to purr all the way up to her food bowl but the look on her face if empty was total betrayal! The Archie photo story cracked me up. He's so expressive! The hexies are looking great. For them do you use a template for the stitching line or for the cutting line? Oh my fav is 2nd photo, bottom right corner! They all look great! Archie is adorable! How nice to hear the neighbors cook for him! love Archie as always. The hexies are great - so much work goes into them I know. Love your posts! Those hexies are amazing - as always. And what a fabulous photo op with Archie. Love him. 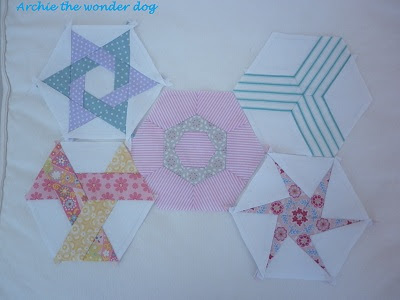 The spotty hexies are my absolute fav, especially the green and purple spotty star of david type one. I'm actually leaving London tomorrow, so I'm a bit jealous too! Hopefully the weather will stay nice for you so that Archie can snaffle more food. 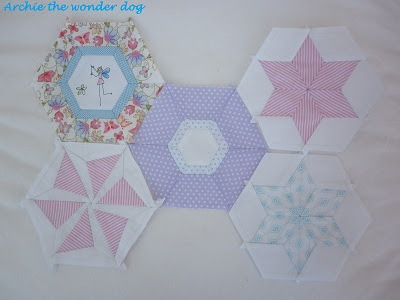 Ok, I have to ask, Are you making these hexies up as you go along? (AWe of your creativity) or are you following a design sheet to get them? (awe of whoever's creativity)? Anyway they are lovely, amazing and gorgeous. So is Archie. And he deserves those scraps! those hexies are fabulous! Love how Archie sits there waiting for something to eat. My mum had a border collie and her neighbours had a rabbit that ran around in their garden: she just used to sit there and drool over the rabbit she was never going to get! Your hexies are looking amazing!! FQing heck! 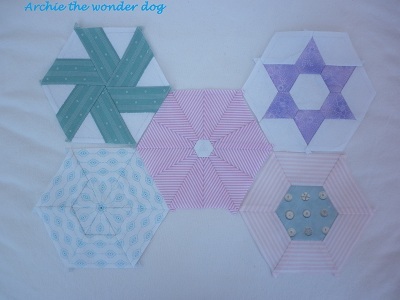 more hexies! lol .... wy are you curling your hexagons, are you aiming to wear them in your hair? 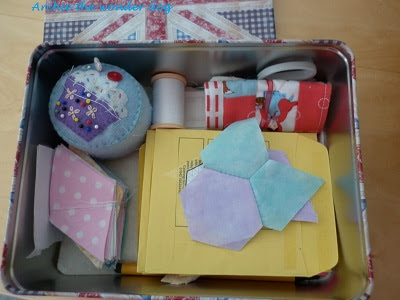 Definitely a good idea to keep fabric in empty biscuit tins, mainly because that means you have to empty the biscuits from the tin first! 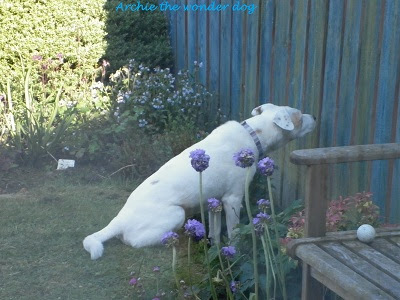 I bet Archie would be a good help with that ... so would I for that matter! 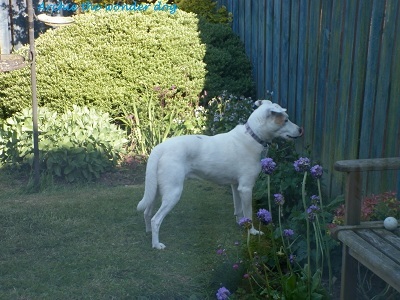 Every BBQ should have a piece of chicken on it for the dog next door! It should be a law. In fact vote for me and i'll make it happen! Ahhh! Your hexies are so lovely!! 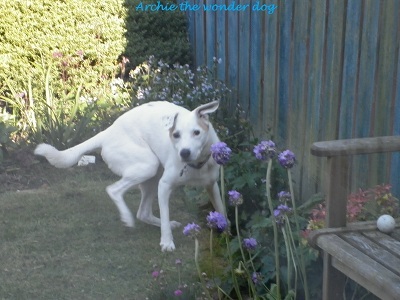 And Archie is his own charming self, as always! 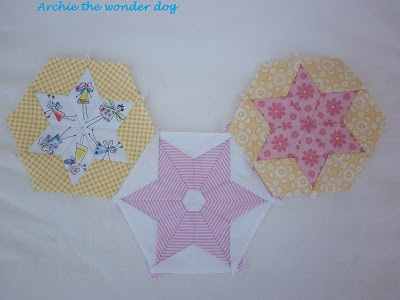 Such great hexies I love the one with the fairy prints so cute! Archie, you had me laughing out loud! Not a good thing as it's 4am and my other half is trying to sleep. 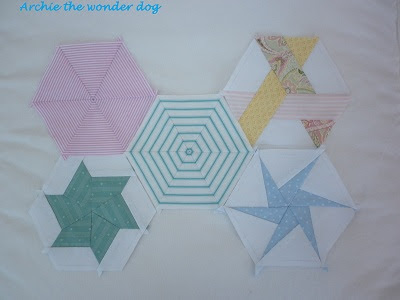 Wonderful hexies, they are just so pretty. Lovely hexies and thread catcher. Oh, I do love your hexies! Gorgeous! 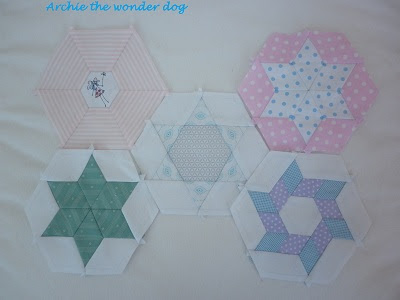 Oh my gosh,those hexies are amaizing ,What size are they..I mean well I make hexies but wow not like these. Hello Helen :) Your hexies are so delicious!! You have some great designs done with them. Poor Archie ;( I hope he has better luck next time. 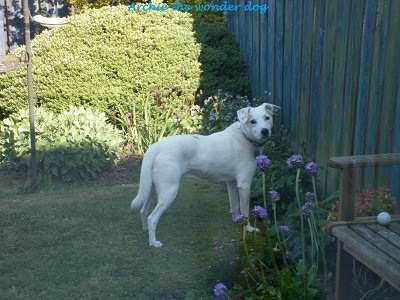 Better late than never - I really enjoyed this post Helen. 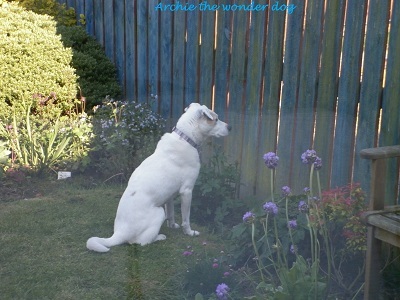 Your hexies are divine but I think Archie has stolen your thunder again - I am so glad your neighbours slip him a wee treat now and again, otherwise it would be too cruel.